Azerbaijan’s talented jazz pianist Elchin Shirinov continues his musical tour with an Israeli jazz double bassist, composer and singer Avishai Cohen. 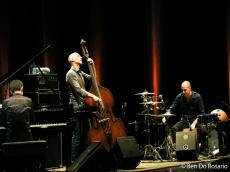 Elchin Shirinov joined Avishai Cohen trio and gave a number of spectacular concerts as part of the world tour. The musicians have already performed in Japan, Hungary, Sweden, Germany and France. November was marked by concerts in the cities of Portugal - Porto, Coimbra, Lisbon, Loulé and the cities of Germany - Munich and Mainz. Each concert ended with a long standing ovation, where the public several times called the musicians to the stage and did not want to let them go. "Avishai Cohen is a top musician. It's a great pleasure to perform together with him on the same stage," Elchin Shirinov told Day.Az. The pianist highly appreciated the work of Israeli musician. Elchin Shirinov belongs to the new generation of Azerbaijani jazz musicians, who combine elements of post-bop jazz, blues and funk. The pianist and composer was tutored by great musical talents such as Vagif Sadikhov, Aaron Goldberg, Kevin Hays, Jean Michel Pilc and Yakov Okun. He went on to give a very individual interpretation of two of the most popular Azerbaijani folksongs Sari Gelin and Durna; and included his reflective self-penned compositions Waiting and Muse in his set, many of which featured the sound of the Melodica, a wind-operated keyboard that makes an accordion-like sound, which he balanced on top of the grand piano. Many music enthusiasts from France, Switzerland, Germany, Malaysia and other countries are already familiar with his unusual talent. The 3 Cohens are that sort of uncommon collective, a trio of siblings from Tel Aviv, Israel – tenor saxophonist/clarinetist Anat Cohen, trumpeter Avishai Cohen and soprano saxophonist Yuval Cohen. Avishai Cohen is called by critics as a rising star of the American jazz scene. Experts note his individual sound and constant creative search. He brilliantly combines various styles of performance. Cohen has stated that he was heavily influenced by Miles Davis. He is among the most influential and acclaimed figures in the history of jazz and 20th century music. Israeli jazz trumpet has become one of the most discussed artists on modern scene.